A Weight Stigma Story; Do You Have One, Too? Today is Day Two of BEDA; the Binge Eating Disorder Association’s Weight Stigma Awareness Week. Here’s Becky’s story. To post your story, Click Here. When I was a child I grew quickly. I was often told I was a “big” girl. I interpreted that to mean fat and fat in my family was looked upon as a bad thing. My grandmother, whom I lived with the first 2 1/2 years of my life, was fat. Somehow it must of been pointed out often because I always remember looking at her and thinking “fat” when I looked at her, as far back as I can remember. Yet she was such a special part of my life – she was a wonderful grandma to me. I loved her very much. She used to tell me stories of how I would stand at the refrigerator door when I could barely talk and say “Meat” – which meant a piece of cheese or meat. I somehow got the impression that fat and big were not the preferred thing to be. I passed my mother up in size around the age 10. I also had a brother who was quite small in stature for his age. I was compared to him and my mom often. I don’t think it would have been a problem except that I already had the concept that small and little were better than big and large. I had another grandmother (who favored boys) who told me I had to be careful not to hurt my brother because he was so little and I was so big. We were only 2 1/2 years apart in age. •When my parents made their rounds to bars on Sunday afternoons and my brother and I were along, one of my pleasures was being able to get bags of potato chips. The bartender once commented that I didn’t really need another bag of chips – something to the effect that I would get too fat. •My mother always talked about weight and weighed herself daily so I did not know that was not normal. •When I asked if I was fat I was told I was “hippy”. •Some boys walking by when I was jumping rope yelled out “elephant legs”. Again I took that to mean fat. •By the time I was 14, I was 5″ 7″ and 124 lbs – I thought that was fat!•When my grandparents made comments like I was too big to pick up and swing around like my brother, I took that as fat. •My nick name was apple cheeks cause of my round face. •There was a boy that liked me in 7th grade. I was telling my mother’s friend about him but that I didn’t want to go steady with him because he was fat. My mom’s friend immediately told me that wasn’t a reason. That was the first time I realized that saying someone was fat or not liking them for that reason was not right. •My best friend in my adult years was fat – she was an amazing person – everyone wanted to be around her. I always marveled at how she handled her size like it didn’t matter (I realize now she understood that her size was only a part of who she was). I remember these comments to this day. I realize now these things contributed to my perception of how I viewed myself. I remember thinking small and blonde was better than big and brunette 🙂 – so silly! 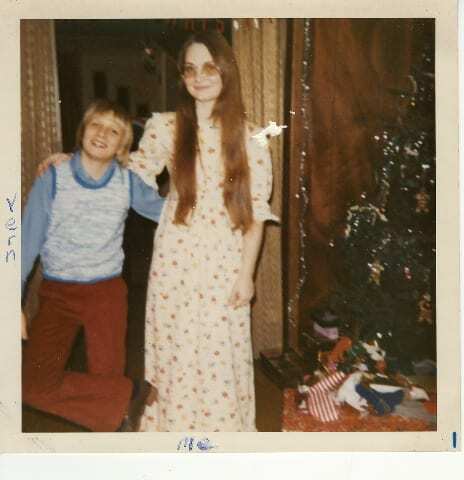 Even at the time of this picture, my brother and me in the 1970’s, I thought I was fat – and was always trying to diet. I don’t think anyone meant anything personally or meant harm, but that is how I took it all.